The return of the Start menu was one of the things that made many a Windows 8 Haters stop griping about Microsoft and take a look at Windows 10. Yes, a variation of that handy little button is back, baby, hanging out in the lower-left corner of the screen. But if you’re used to the text-based list of items like in Windows 7, Vista and XP, this new-fangled Windows 10 Start menu looks and acts a little bit different. How different? For one thing, it takes up more space when you pop it open, because Microsoft has shrunk down the old Windows 8 Start screen (the one with the little colored self-updating live tiles) and stuffed it into the Start menu. You can tap or click a tile to open its app, like Weather, Photos or Mail. You can ditch or resize the tiles within the Start menu as you see fit. So that’s nice. For a lot of people, the Start menu was where you went every day to, well, get started — by opening your programs. The Windows 10 Start menu has a variation of the old All Programs menu found in previous editions, except now it’s a vertical list of little app tiles. Links to the File Explorer, system Settings and logout/shutdown button are all here in the new Start menu, too. And as with previous versions of Windows, you can pin your favorite and most-used items to the Start menu so they are always nearby. You can even combine pinned apps into a group. 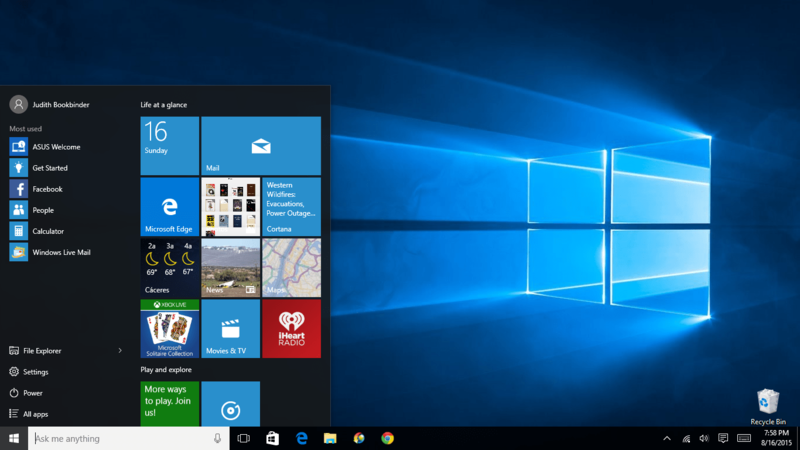 Windows 10 brings along some new things as well. For one, Cortana is hanging out down there at the bottom of the screen, waiting for you to ask her stuff. Think the Windows 10 Start menu is too small and you miss the expansive Start screen of Windows 8? You can go back to the Windows 8 days when Start takes up the whole screen by changing your settings. You have options. No matter if you’re coming from Windows 8 or an earlier version of Windows, elements of the Start menu will look vaguely familiar. For those who avoided Windows 8 and clung to XP or Windows 7, popping open the Start menu in Windows 10 can feel just like coming home again — albeit to a slightly bigger, colorful redecorated house that talks back to you.